What do you get when you combine a wish to embrace technology in the science classroom with a desire to heighten students' awareness of global environmental issues and instill in them a sense of social conscience and civic responsibility towards the environment? You get award-winning teacher John Cordukes from Cobourg District Collegiate Institute West in the Kawartha Pine Ridge District School Board. Cordukes was one of 72 Canadian educators to receive a Prime Minister's Award for Teaching Excellence in 2003. The award recognizes "outstanding teachers who provide students with the tools to become good citizens, to develop and grow as individuals and to contribute to Canada's growth, prosperity and well-being." Cordukes and department colleague Niels Walkau created a science web site for the school (www2.kpr.edu.on.ca/cdciw/science/index.htm) in 2000. The site is designed to motivate students and bring science to life. It offers students homework help, hints for tests, study tips and practice tests, mark updates, slide shows of student labs, movie clips of significant science activities, links to extension articles, crossword puzzles and an invitation to e-mail teachers if they need help. Perhaps most significantly, it also contains pictures of student work and of science students in their classrooms. Cordukes explains: "Kids are motivated by seeing themselves on the site. They love it when they can show Grandma in another city what they are doing in school, and they are proud when their work is posted for others to see." Cordukes's students often use digital cameras. "When we conduct field studies the kids take pictures of the flora and fauna, which helps them describe what they saw for their reports. In class they draw and take photos of what they see under the microscope. This gives them two perspectives and helps them describe microscopic objects thoroughly and accurately. "Equally important, students learn to use technology that will be mainstream in a few years, and they learn to use computers for meaningful work, not just for games. When students create formal lab reports they must include labelled pictures and I post the pictures on our web site. I expect a lot from my students and the technology allows them to produce outstanding work." Cordukes estimates that 95 per cent of his students, including those studying at both the academic and applied levels, have computers at home. "Those who don't, have access at school, so access is not a problem." Case studies are also found on the site. These, it is noted, illustrate how the theory of science class is carried out in actual situations. The case study on tracking and position, for example, provides a chance to practise vector work in tracking Nate, the peregrine falcon, and to ask broader questions about the implications and limitations of science in real life. The web site site also offers practice tests. Although Cordukes doesn't have hard data to prove that his students are doing better using these tests, he knows they are. "I see a strong correlation between the students who do well and those who use the tests. If students are disappointed with their test results, I encourage them to try the practice tests. They have become another tool we use to help our students succeed." Cordukes explains another important benefit of posting practice tests. "It's sometimes difficult for parents to help their children study for the high school curriculum. With these tests, they can work together to complete the questions and review the answers, which are also available on the site." A popular area of the web site includes crossword puzzles, which students use to review, study and earn bonus marks. Cordukes has found that students are more likely to start studying early for unit tests when they use the on-line crossword puzzles. And again, activities like this help his students succeed and stay motivated, especially when bonus marks are offered. One of the most important aspects of the science web site involves marks. As in many schools, Cordukes and his colleagues use a marks program and regularly give students printed updates. As well, science teachers now post marks on the site. This allows students and parents to access marks, while the use of numbers rather than names helps maintain student privacy. Beginning this year Cordukes and his colleagues started e-mailing marks to some parents. Not all parents want this service but many do. "I usually only have time to call home when students are having difficulty. With this tool, good news is also shared with parents." What's more, e-mail eliminates a lot of telephone tag. Many teachers have experienced the frustration of repeatedly and unsuccessfully trying to reach a parent, or leaving a voice message and wondering if it got through. With e-mail, parents can receive regular updates. More importantly, when marks are updated a message is sent to all parents on the list. Cordukes acknowledges that many teachers are neither adept at nor interested in creating and monitoring web sites, but he says it's not difficult. "If one person in a department can set up the site - and there are programs to help - then others can easily add information and use the marks programs. Our web site has become a time saver as well as an invaluable teaching and learning tool. It complements what we are doing in our classrooms." 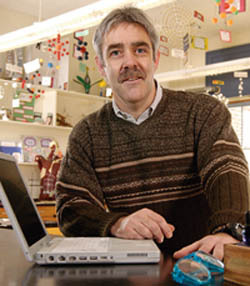 In 1997 Cordukes started his Worldwide Biome Project, an integrated biology/computer project (www2.kpr.edu.on.ca/cdciw/biomes/index.htm). Biology students conduct field studies in their local ecosystem and report their findings as a class project on the site. By posting their work they are able to share it with students around the world who are conducting similar projects. Students also participate in e-mail exchanges, discussing information about their local regions and relevant ecological issues. Cordukes began by posting his own students' biome projects, using his board's server. Then he contacted other science teachers in his board, encouraging them to do the same. Next, he connected with educational organizations throughout the province and word spread. He found online educational forums and discovered other teachers interested in conducting similar studies. Once he was linked to search engines it wasn't long before educators from across North America were contacting him to join in. The site hosts projects from classrooms in New Zealand, Kenya and the United States as well as locations throughout Canada. Earlier this year a report from a student on an expedition to the Antarctic was added. Cordukes highlights the benefits: "It's motivating for students that people all over the world will see their work. They know it has to be perfect because they are the only ones to publish primary data on their local biome. When the kids see schoolwork become real and meaningful, they do a better job. This kind of project validates what we do in school." As well, students learn about places they may never visit. They see similarities and differences and gain a broader global perspective and appreciation for others - in terms of both science and larger societal and geo-political issues. The site is also an excellent resource for teachers, offering instructions and a protocol on how to undertake a genuine field study with their own students. Another benefit is the fun factor. "Kids love being outside and conducting field studies. In the early days they marvelled at communicating with students all over the world; it was a thrill to chat with kids just like themselves in the Arctic or Romania." Students also use the site to review and prepare for tests. They aren't restricted to using their notebooks, and this helps them to succeed. Cordukes's enthusiasm increases as he talks about taking his students outside to study. "I believe that kids can't learn biology exclusively inside a classroom; they have to be outside to experience what we study in the books." This is particularly helpful to kinesthetic learners. "Besides, I love the outdoors and I want them to as well." For several years Cordukes has involved his students in projects like tree planting and fish counting and tagging through contacts at the Ministry of Natural Resources. "In class we talk about the fact that Atlantic salmon were so prevalent in the Cobourg area at the turn of the century that farmers caught them in creeks with pitchforks and used them for fertilizer. Now they are all gone. "I take the kids out when the ministry staff are restocking. Students are each given a pail of finger-size salmon and hip waders. Their job is to place a fish behind a decent-size rock. It's amazing, but a salmon is territorial and it will stay in that one spot and mature for two years. The students have a great deal of fun. They make important contributions to their local ecosystem and their experiences complement what they learn about conservation in our ecology unit." One of the highlights of each school year comes in the spring when Cordukes arranges to take his students tree planting. Cordukes's wife is a Kindergarten teacher and the two join classes for the outing. A few weeks before they go students are paired and exchange letters. On the day of the outing little and big buddies meet for the first time, chat a bit and then spend a morning planting up to 1,000 trees. They have a picnic lunch together and then read and play in the afternoon. "I've been doing stuff like this for 20 years and it's fantastic. My students love being role models and they always rise to the occasion. It's wonderful to watch a big kid sit and read with a small, wide-eyed child." When his students are happily engaged in their learning, Cordukes is happy. What advice does this 20-year veteran offer his colleagues throughout the province? "Take time to identify your strengths and integrate them into your classroom. For me, it's the outdoors and technology. Using them motivates me to do my best work, which in turn motivates my students. Your enthusiasm, if it's genuine, will spread." John Cordukes is a special educator. What he does in his science classrooms may sound simple but involves hard work and dedication. His enthusiasm and creativity fuel his award-winning programming. 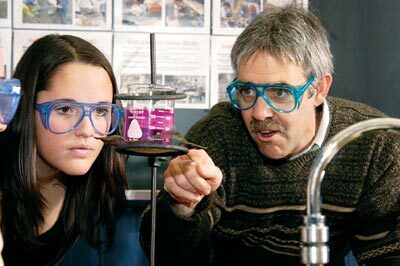 Not all teachers who experiment with such ideas will win an award of excellence, but they will certainly help legions of students be happier and more successful in school. And isn't that what teaching is all about?